Stories of many bloody battles of the Arabs, Iberians, Mavritans and Spaniards are connected today in the majestic fortress Morella (Morella Castle). Built on a high hill it dominates the title village Morella, it is the peak point of the historical sights of Valencia. This castle is located in Castellón, a high rock, which was built many centuries ago presently is surrounded by lush greenery. Morella is a huge medieval fortress, with miles of surrounding walls, which was originally built by the Arabs. The castle was the center of many battles and was destroyed and rebuilt many times. To this day, the design of Morella keeps debris from the construction of each historical period. In the turbulent history, Morella was the scene of many battles for supremacy, conquest from different nations. Even the Romans were with a bastion here. Over the centuries Morella tolerated increasing consolidation and expansion of construction, with the result that it becomes a virtually impregnable fortress. To be conquered you need more than ordinary offensive tactics. Attempts to capture Morella are often intertwined with the very clever and subversive strategies designed and intrigue. Around 1088 during Rekonkista, El Cid attacked the massive walls of the Morella in their attempts to conquer the Moors. As we see today, the fortress was built sometime in the 13 century. At the end of 1800 Morella Castle was captured thanks to a breakthrough in one of the toilet holes of the palace. After 1840 the castle was abandoned and began to roll. In 1270 King James I ordered the construction of the monastery beyond the thick walls of the fortress Morella as a result of which, here was erected the Gothic monastery of Saint Francis. Parade Tower (La Pardala Tower) is so named because a legend that tells of a local woman who was hanged here by French troops during the wars of independence. The walls of the fortress descend from the hill down to the city and reach a length of 2, 5 kilometers. Morella today keeps 14 towers and 6 large gates, among which particularly impressed is the Gothic portal of San Pedro. Morella Castle consists of several separate buildings, including the governor's palace, prison yard, called Celoquia Tower. In the Middle Morella was used primarily as a prison. 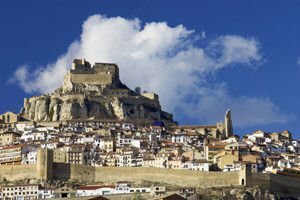 Overall, the fortress was built on three levels - the first is that of the outside walls and the entrance to the Palace of the Governor, the second is for the military entourage of the Morella, and the above is a mere castle. Walk across the wall was a whole adventure through small streets and mazes. Morella was declared historical artistic monument by a special decree of June 3, 1931. The castle is open to tourist visits every day against an entrance fee of 1, 5-2 euros.